It is Wednesday. Sunny out. I just got home from a morning of errands and walking and sunglasses. Waltzed in the door and dove right into my platter of these Easter Bunny Cupcakes in the fridge. Devoured two. With a big glass of hydrating water. And I feel really good about that. But why? I mean, cupcakes for lunch?? Madness. 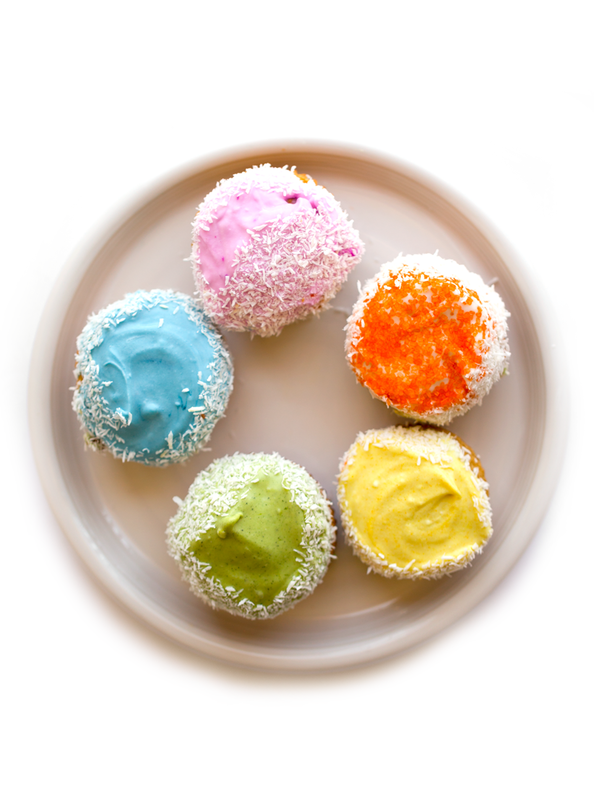 Well my friends, these fluffy, spring-y gems are pretty healthy on the cupcake spectrum. (Pssst. 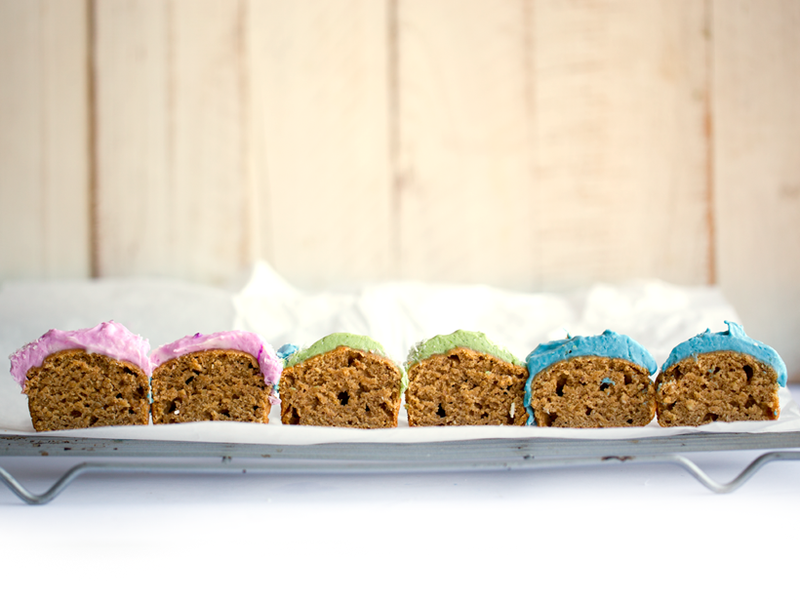 Don't tell the kids, but they are almost like muffins masquarading as cupcakes..) So I'm happy about that. But basically, they just taste crazy good. Easter Baking. 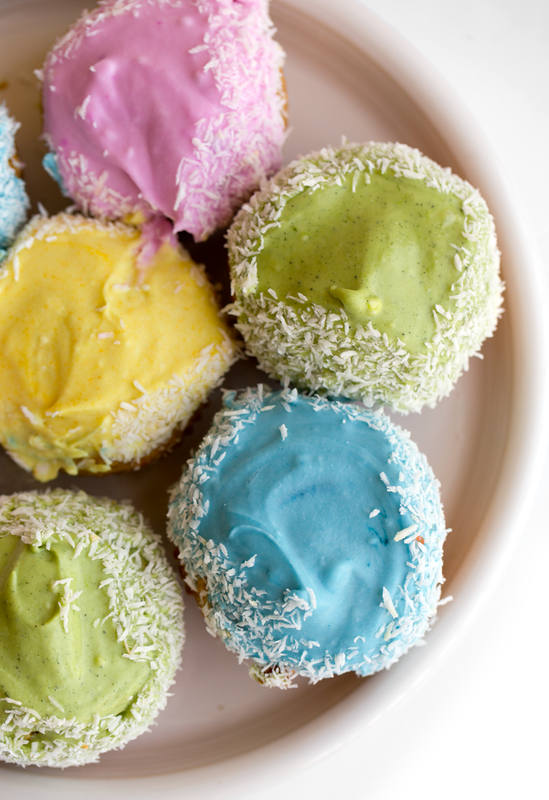 These colorful vegan cupcakes are a great plant-based alternative to egg dying around Easter time. 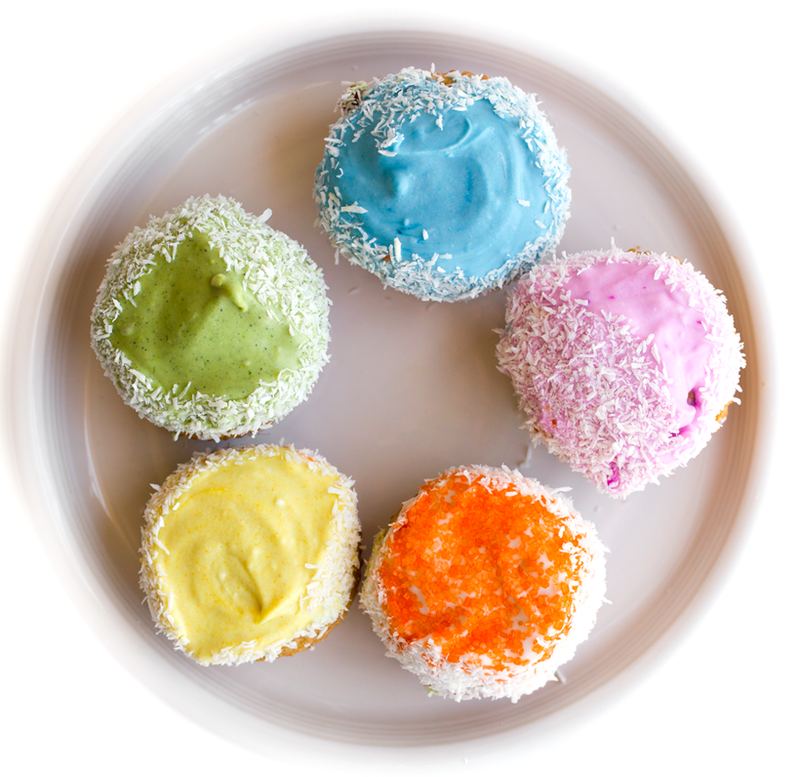 Fluffy almond-coconut cupcakes (that are dense and awesome enough to double as plain old muffins) are topped with a super simple, coconut whip frosting, dyed in a pretty array of pastel colors -- all from plants! 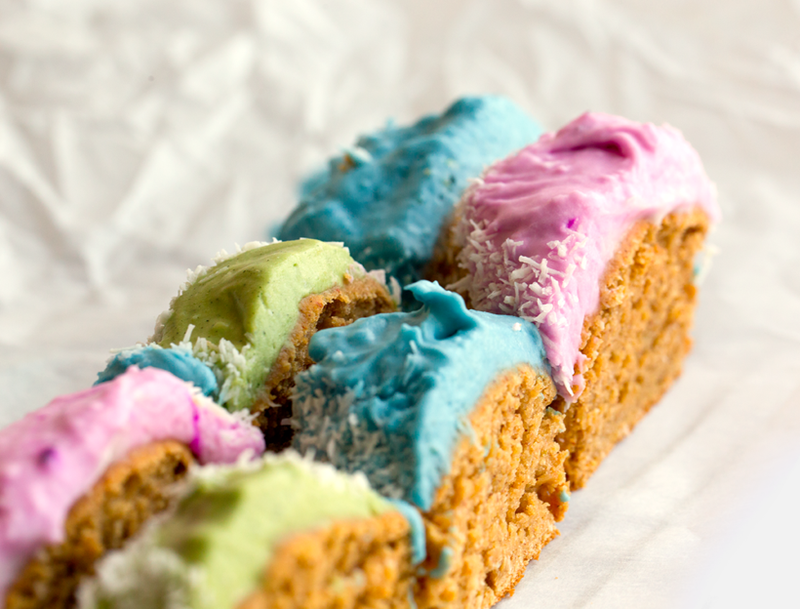 Get the recipe and have a rainbow platter of your very own.. 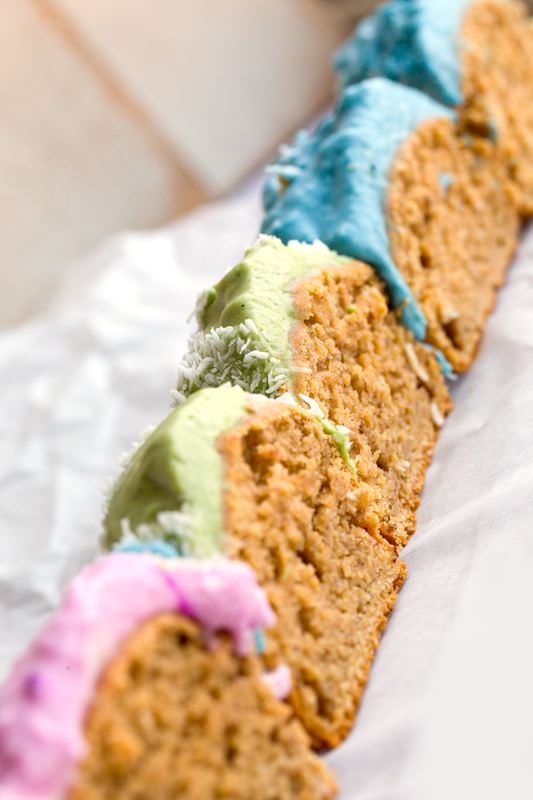 I love using the simple coconut milk frosting for these.. These are actually so yummy without frosting, they could absolutely double as muffins.. So there are not any actual Easter bunnies faces or frosting designs on these cupcakes. So if some search engine brought you here for that, I apologize. But truly, I encourage you to keep reading anyways, because the actual Easter Bunny, the one in real life, obviously, would totally make these instead of those old school colored eggs, if only he had the recipe. Well you do have the recipe! One up the Easter bunny this year. Just saying. Colors From Plants. I want to warn you that a few of the plant color ingredients are hard to come by. So if you are committed to baking up a full rainbow of colors you will need to hop over to Amazon or some fancy natural foods store pretty quickly and buy a few specialty ingredients. I am warning you now, because I know many of you frown at specialty ingredients .. hey, me too, I get it. RED/PINK - pitaya (frozen packets) or beets (juice or crushed bits) -- warm 1/2 tsp of frozen pitaya, just to room temp. Stir into the frosting. A little goes a long way. The same for beets! A small amount of juice goes a long way. ORANGE/YELLOW - colored sugar sprinkles (plant-based) or turmeric - 1/8 tsp or less of turmeric achieves a bright color. GREEN - matcha green tea powder or spirulina - Whisk in to combine. Add a little at a time until the color you want is achieved. BLUE - blue green spirulina capsules, aka Blue Maijk (this is the trickiest one, but does offer up a gorgeous color) - same at the green, whisk in to combine. Add a little at a time until the color you want is achieved. PURPLE - wild blueberries or acai powder (I left this out, but also possible) - Wild blueberry juice can pack a powerful color punk for a light purple. Acai powder creates a more brownish purple color. Easter "Lamb Cake" or other shapes could totally be applied to this recipe. A "Lamb Cake" was always a baking tradition in my family. And I veganized a version a few years ago..This post has those details and a recipe. 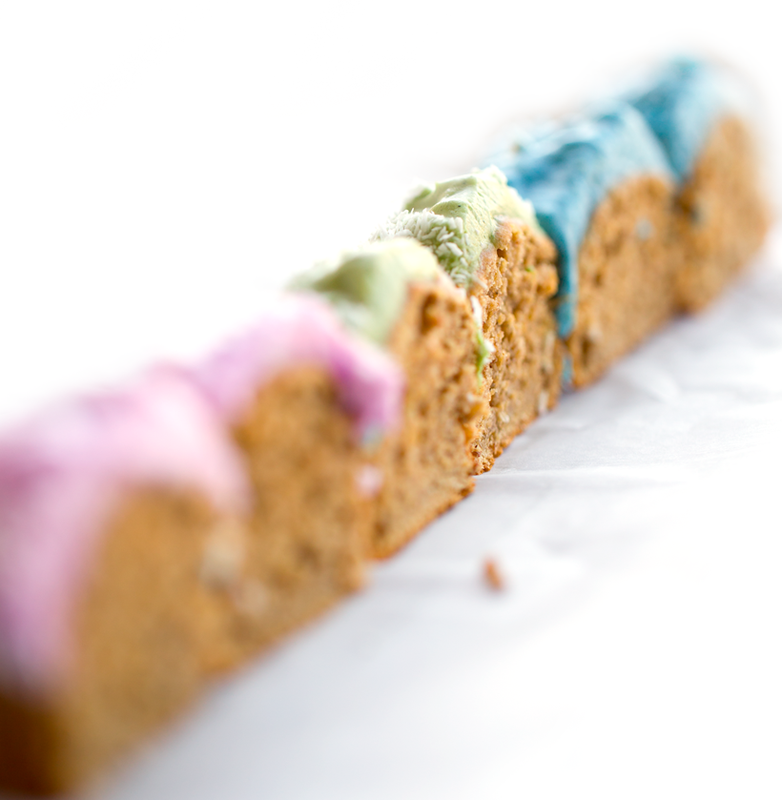 So give these plump little gems a try and I promise you will be totally impressed with your rainbow-making skills. 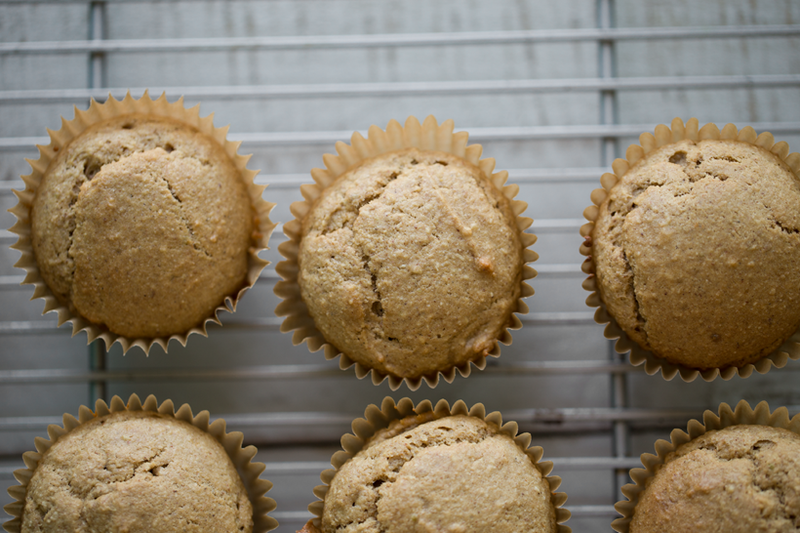 These fluffy almond coconut muffins bake up hearty and dense with amazing lightly sweet flavor. 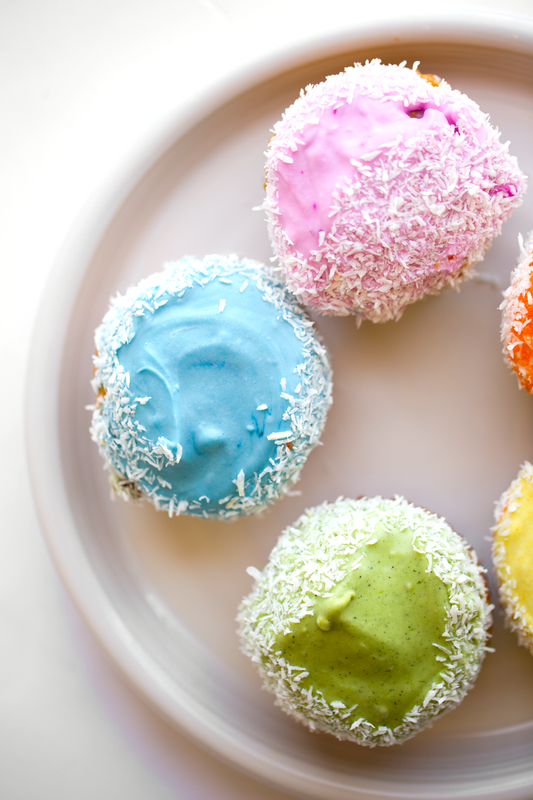 These can be topped with coconut frosting, or simply eaten plain. Prep Notes: 1) Your coconut milk can needs to be fully chilled before using. this means sticking it in the fridge overnight before use. 2) DIY applesauce is encouraged for this recipe. I blended a small green apple with about 2-3 Tbsp of water to create my quick blender apple sauce. Store bought will work, but you might want to add in 1 tso fresh lemon juice to add some acidity that cooked applesauce can lose. 3) Preheat oven to 375 degrees and line cupcake tin with cupcake liners. Add the coconut shreds and raw almonds to a high-speed blender or food processor. Blend until smooth and four-like. Pour mixture into a large mixing bowl. Use your fingers to break up all the large clumps. Add in the flour, baking powder, salt and coconut sugar. Toss well to combine. Add in the vanilla extract, melted coconut oil. Whisk into the flour mixture. Then add in the non-dairy milk, optional cinnamon and applesauce. Continue to whisk well until a thick and fluffy batter forms. Scoop the batter into the lined cups. Bake at 375 for 10 minutes. Then reduce heat to 350 and bake for an additional 8-12 minutes. You want the fluffy tops to be firm and the center cooked through and fluffy. Fully cool cupcakes before frosting them. Frosting: Add the powdered sugar, vanilla and coconut cream (the white hard part of the chilled milk) to a tall medium mixing bowl. Using a mixer, blend from low to medium until nice and fluffy. Do not overblend or the frosting will start to lose its fluffiness. Transfer frosting to a bowl and place in the fridge to chill for about twenty minutes, while the cupcakes cool as well. 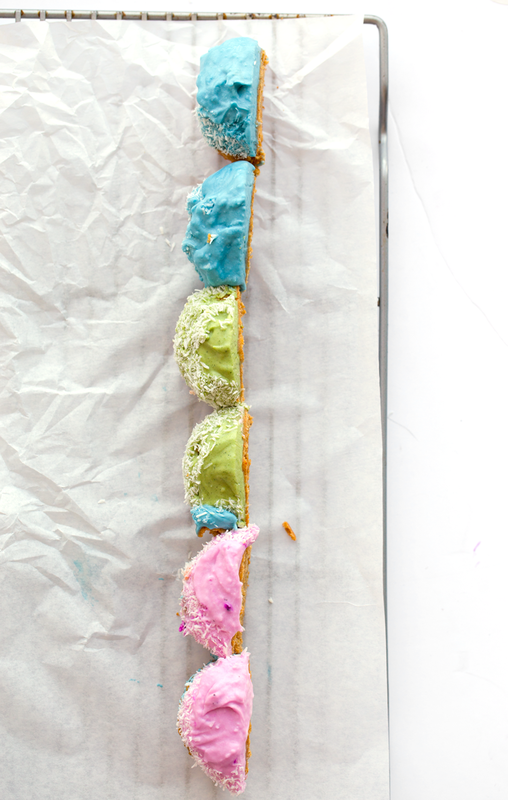 Coloring your frosting? Before placing the frosting in the fridge, separate the frosting into smaller containers - however many different colors you will be using. Then whisk in the coloring materials very well to create the tints. (See post for details). Place in fridge. Final step: Frost the cupcakes. 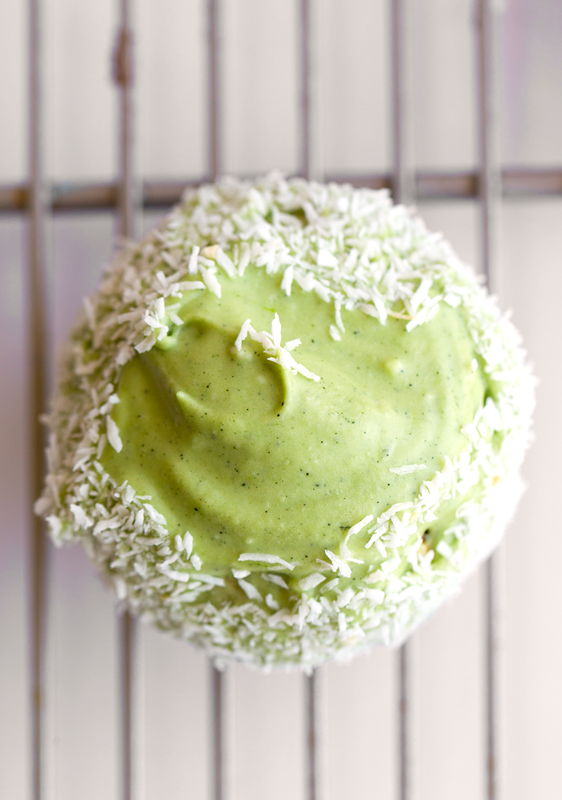 Optional: Roll edges in shredded coconut. Serve! Happy Easter, spring or rainbow season.